Turn your portable drill into a drill press. Turn your portable drill into a drill press and get the accuracy you need at a job site! The guide attaches directly to a 3/8" drill chuck, and allows you to drill larger pieces you can't fit on your stationary press. 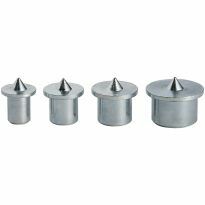 Pre-drilled holes allow you to attach a base or mount it to a table. It works great I’ve used it a few times since I got it it made the job easier and quicker. I am making a vibrating table to be used when casting plaster or concrete into molds. The drill guide allowed me to drill a 1/8th inch pilot hole through the combined 3 inches of wood materials that made up the table. After I had drilled pilot holes in each of the four corners I was able to accurately insert threaded rods and springs confident that they would be vertical and relatively parallel. Inaccuracies appeared during rod installation, but this was easily corrected with better bolt adjustment. I also used the drill guide to accurately drill holes for the vibrating motor mounts so that bolts could confidently be placed It is a great tool for this kind of occasional use! There wasn't much design tolerance. The 6MM screws had to fit into the 6MM mounting holes. It worked well. Very nice drill tool. Is easy to use it. This is the closest you can get to a portable drill press. I drilled 450 holes across 5 sheets of ply. Straight and true. Excellent little tool. It was perfect for drilling my 10 degree holes for the foot stools I was making. It was so simple to assemble and use. Solid and did what I needed it to. I didn't need exact precision so this did good but wasn't perfect but that's not why I bought it. Bought this on sale, and have wanted one for a long time. I have 2 drill presses but there is so many times you need to drill accurete holes on projects you just can't get on, or to a drill press. My dad used to have one like this and it was our drill press. IIt worked great! put it to use yesterday. There was no deviation from the tools function!!! This was the perfect tool needed to finish my deck building project!!! It performed wonderfully!!! I can't believe I waited so long to get this. It replaces my drill press for 75% of what I do! Really easy to use and accurate. I bought this drill guide to drill holes in the bottom of a live edge table I'm making and I wanted the legs to angled out on a 10 degrees. The drill guide worked great. Did exactly what I needed; without it I wouldn't've been able to complete the project I was working on. When I explained the drilling problem I was having to the Rockler employee who helped me, he recommended this tool; I'm glad he did. Works great. Really helped us to make a fantastic industrial entertainment center. Quality product. Great addition to my work shop. Works as advertised. Was able to drill straight holes, mounting hardware was a snap. I got this to drill more precisely where a drill press can not reach. Makes that process so much easier. The rig has holes in its base for mouting the system, as others have noted. 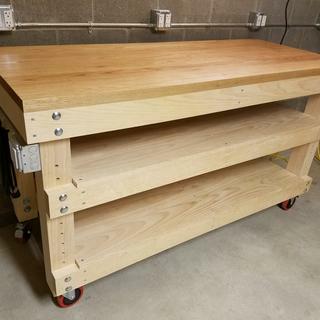 I used that feature to design a base for the press that will allow for holding and drilling counter sunk screw holes in sections of hardwood flooring. The base holds the boards, and allows for the press to move side to side to allow for drilling two holes beside each other. I sacrificed very little portability and it's a great use for that &quot;cast aside&quot; cheapo cordless drill I was ignoring. Its applications are limitless if one is willing to be inventive and develop a solution for their own needs. I say 5 stars for making my life easier. 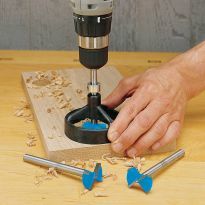 Great for drilling exact holes in pieces too big to get up into the drill press. This drill guide is affordable, well balanced, and does what it is design to do. This is a tool i wish i had long ago. Drilling straight holes in the center or any where on a larger piece of material your floor or bench top drill cannot reach was a breeze with this! Good, quick, portable when you must have a straight or angle hole in place or can’t afford drill press. A good add to tools to get the job done. I bought this to use my 1/2" bit to drill some dowel holes in the edge of a 2x to make a floating shelf. I own doweling jigs, but none would accept a 1/2 bit. This tool worked for the shelf and has nubs on the bottom to make it self centering by turning the base until the nubs touch each side of the lumber. I would have gave a 5 star; however, the "rack and pinion" is a little "sloppy" but was workable and everything was smoother after a spray of lube over the vertical rods. Great for on site application where a precise 90 degree or angled straight line hole is needed. Depth guide is super helpful as well. My only complaint would be that when adjusting the drill guide to the position or angle you need, there are no well defined notches for common angles such 45 degrees or even a straight 90 degree hole. In other words I find I have to check my angles with a protractor or square to ensure accuracy. Built my work bench using this tool drilling through 4" legs and 1,75" of white pine so my shelves are adjustable. Worked like a charm. Used Dewalt 1/2" drill bits. I totally get that this is not a 'precision' tool, but it worked perfectly for what I needed. I needed to go through a 4" piece of cedar with a 2.5" hole saw and the guide allowed me to go through from both sides and the plunge was barely off went I went in from the other side. Great addition to my tools. this tool does the job with fairly good accuracy. as we mature we need a little help keeping things lined up. The one it replaces was not able to change the angle so it was better for 90 degree holes. 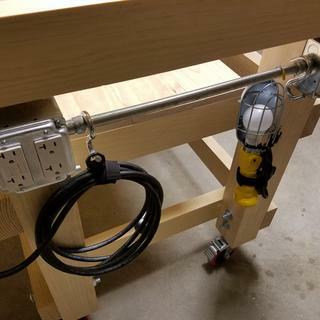 This device worked just fine for making straight 3//4" holes in my workbench for bench dogs. For the project that I was working on it worked out well. It is not exact as a good drill press but never the less it will come in handy for some future projects. i am also very pleased with the employees of your Ontario Ca. Store. Especially Darryl. I haven't gotten to the point to use this item for which it was purchased ,but have had other uses for it and was quite pleased with its operation. It is important to clamp it down properly, and then everything goes great. Note: follow the instructions. A little wobbly and sticky, but it sure beats anything else at drilling perpendicular holes in the field. I don't use it for shop work. Much better than guess work, well-built, gets the job done. The guide allowed for a little to much play room for me. It needs two people to operate. It also needs a level. Please note I was using it for putting in a railing on a stair case, not the easiest of tasks for someone of my limited experience. not a high person tool how ever easy to use reasonably durable construction for this price range. This is definitely better than a lot of the other brands out there, especially the plastic ones. 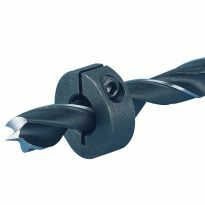 If you're drilling with spiral drill bits, it works pretty good but if you are using larger forstner bits and then it needs to be well stabilized. There is a lot of play/wobble when drilling. I wish the base was made of a heavier steel, not aluminum for stability and I also wish the guide rods were more rigid. The angle gauge isn't the best either. Works well for a multitude of projects, especially when you do not have the space for a big drill press. The drill chuck tool is not very good. I use another one from a good drill. This drill guide works reasonably well although there is a little play in the chuck. Keep in mind you are limited in the length of bit you can use - I had to do some searching to find a bit long enough to do the job and still fit in the device. This is a good item if you do not have a drill press. It does not give drill press accuracy, but it is very portable and worthwhile if you have a small shop. There is quite a bit of wobble, but it is small, portable, and reasonably accurate. I purchased this tool to drill holes for stair balusters in a handrail at a 38 degree angle on the job site. I even made a jig to clamp the drill guide to the handrail for accuracy. There is too much play and it tended to wander too much. The markings for setting the angle were a disappointment and difficult to line each side up. The 3/8" chuck seemed cheap. Worked fine for drilling 90 degrees. Was looking for a tool that could sub as a temporary filler for a drill press before I purchased one. Many limitations in functionality, primarily set angles… I was looking to do a 6° angle and that’s not option.?. Without creating a jig of some sort...which makes this tool useless. Also, the first time I used it the bit slipped because it was not tight enough and the tool to tighten it was not lined up enough to further tighten without the bit slipping. I have since bought a used drill press and may see if I can return it. The depth stop is not accurate as the spring will not compress accurately each time for repetitive holes. For drilling a hole not using he depth stop it works pretty good. Putting up floating shelves this will be valuable. Replacing worn out guide (different brand) purchased years ago. I’ve used it for hundreds of projects. Very handy when drill press is not an option. This looks like a viable alternative for a "low budget" drill press. I'll let ya'll know how it works when I receive it. Always wanted one. Good reviews. This one was on sale. Can put adhesive padding underneath to avoid marring the wood surface due to clamping pressure. I already have a drill press but this gives me greater flexibility for drilling vertical holes. I have a stair project and need to drill the holes for new metal spindles in an existing angled stair trim. Not good at 90 degree drilling so this helps a lot! Great reviews and hopefully suits my needs. For drilling dog holes in my newly constructed workbench. 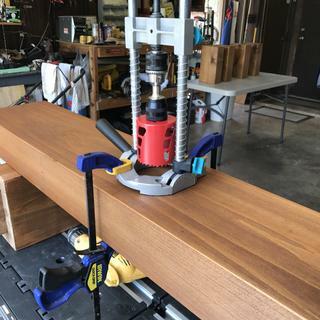 I needed to drill long holes in the width of a slab for hidden mounts for a live edge shelf. 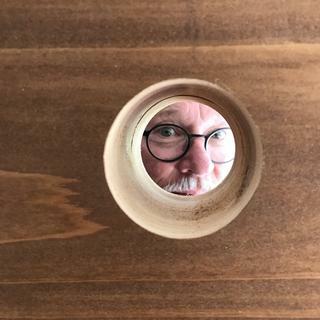 My drill press has not been moved to my new house so I need to have something that can help keep them centered and straight on my piece with a handheld drill. Starting a major project which requires multiple accurate holes for post and beam assembly. The guide should eliminate possible errors. Like the looks of it over others I looked at and most review rated it 5 star. Sometimes you just need an extra hand! I used to have one which was "borrowed" by parties unknown. I now have a need for one. I needed to drill straight, depth controlled pilot holes but do not have room to store a drill press. I chose this because it was paramount to drill my holes as parallel and straight as possible, for my workbench assembly. It was also useful to drill my bench dog holes in the top. Compared to similar product review online, this product has stronger features and appears to be of high quality. For home projects, I needed a simple (and inexpensive) way to drill straight holes. on a 90 deg. drill position, what is the longest bit that I can use? I am going to drill hardwood flooring to put plugs in for looks only. will this work for that? I need to drill holes in 6 x 6 posts for cable rail can i do that with this product? BEST ANSWER: Not real clear on what you are trying to do. But if i understand it correctly, you are drilling a hole through the side of the 6x6 to pass a cable through. The post will be used to support the cable, like a fence post? If that is the case, then yes the product should work. You might be limited on the depth of your hole due to the length of th drill bit and what the press will accommodate. I have to drill through 8"-12" glueLam beams. I utlize the press to get my hole started straight. Then i switch to a longer bit in order to finish the hole all the way through. I would think that this press would get you through the 6x6 post. If not, then you will have probably less than inch to finish out the hole. I used this tool for the exact reason you are asking, cable railing, only on 4x4’s! I got straight thru and my client is very pleased with the install!! There's no reason you shouldn't be able to. If you are drilling a hole through any wood surface, this guide would be helpful if accuracy is important. So I can use 8-10" bit? Well, I'm not sure about that. The thickness of your wood and how far the drill press springs compress when you push down on the drill also come into play. The previous responder had a more detailed answer that might answer your question for you. I need to drill 1" holes through 6" x 6" red cedar. My drill bit is 7" long. I have two questions. Will the torque for this project be too much for the drill guide? Can the drill guide accommodate a 7" bit? I have bought that same drill guide a couple years ago. My wife wanted a gin and tonic rail on our deck. I had 10 post 3 1/2" x 3 1/2" that I needed to drill 2 - 1" holes to feed in the 1" copper pipe through to make the top two rails. I made a jig out of 1/4" plywood with the two holes drilled at the right position then flipped over the post and drilled in from the back side. The holes lined up prefect to give me a clean hole all the way through. With the right drill bit and drilling through both sides it should work fine. You need 3" deep hole from each side to make it work. You will not made a 6" deep hole drilling through from one side you will have to flipping the post drilling from both sides. 1. The drill guide will just barely accommodate a 7"drill bit. The bit I used had a "brad" point. 2. If you're very careful and bore the hole very slowly, you can successfully bore a 1" hole. I'd suggest that you use 2 "C" clamps to firmly attach the drill guide to the 6" X 6" board. Just be careful to not crush the frame of the drill guide. While I haven't used the drill guide to bore 1" holes in ^" X 6" boards, I have used it to bore 1" holes in 3-1/2" X 3-1/2" oak. Just be sure you don't force it. I forgot to mention 1 thing that's critical to my previous answer. I broke my drill guide on my 1st attempt to use it to bore a 3/4" hole because I used a "SPADE" bit instead of a "twist" bit with a brad point. If the bit you're planning to use is a "spade" bit I wouldn't try it, since the spade bit creates too much torque. I need to auger 1/2" to 7" deep from the bottom of a 4' 4x4 cedar post so I can insert a threaded rod. My bit is 17" long. Can this be mounted on the bottom of a 4x4? BEST ANSWER: I think your bit will be too long for the drill guide and the drill guide cannot tolerate a lot of torque. Take the board to someone who has a drill press. You won't be able to fit a 17" bit into the guide. Without measuring I would say about 7" is the clearance on this tool. What is the maximum depth travel of this thing? In other words, what is the deepest it will drill without adjusting the bit? I seem to have a hard time finding these most basic of specifications on tool adverts these days. What is the largest diameter hole saw that can be used to cut a hole at a 45º angle, please? need to drill holes into small glass panels.. 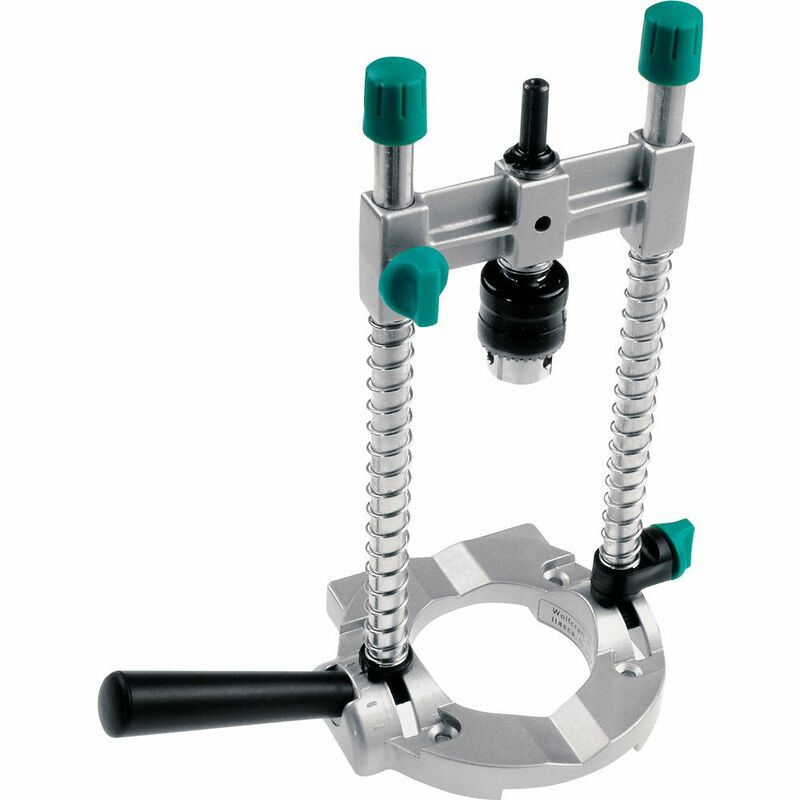 Need a very sturdy drill press for portablel drill Will trhis do the job and not wiggle to split the galss? BEST ANSWER: Not a very stable item. Fair for drilling basic holes in wood and metal, but not something I would attempt to use in "small glass panels". I feel it would be awkward and not stable enough. I purchased to use in the interim till I find a drill press and used only once to drill some small holes for a small project. I had to wrestle with it to make it work for that. Just too much play in it overall to use with any precision. I would give it about 3 stars out of 5. I've never used mine to drill into glass but, like any other project, holding the material (i.e. glass) and the drill sturdy is the way to go. The base of this item can possibly be clamped down on your glass to provide a sturdy environment to make your holes. Again, this would depend on the size of glass, how much space is available on the glass for clamping, etc. As for using it on wood, it works just fine! It's a nice press. I used it to drill mortises. It does have a little play in it, but what may really cause you trouble if it needs to be rock solid is the mechanism for setting the angle. Under pressure, that gave way on me a couple of times. Sounds like if that happened to you it'd be a problem. It's good for woodworking though. Pretty sure I would not recommend this for the application you describe. It worked OK for my needs and I put it thru a workout - but I pretty much wore some of the bushings out getting the job accomplished. Not near enough stability or control for trying to drill glass. I have used the product only for drilling into wood. In order to use it with glass panels I suspect that you would need to add some sort of adhesive rubber coating to the basein order to avoid slipping. BEST ANSWER: Metal frame construction. Sturdy, stable, and easy to use. BEST ANSWER: Yes. On the bottom right (in the picture ) is a knob that can be tightened to the bar. After you raise it to the desired height and the spring compresses to that point. I bought this for a project of building hand rails with spindles. 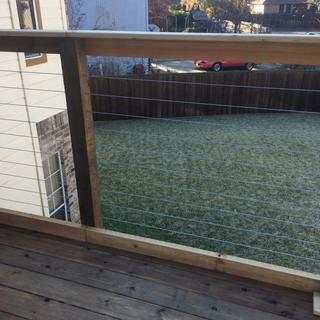 I aborted the project and purchased pre finished railings. I have not used this drill guide. Looking at the picture there is an adjustable stop. Yes, the depth stop is pictured on the shaft and has a green thumbscrew. Project: To drill a 6" deep 3/4" diameter hole in the center of an 18" tall log. The logs are 3 to 8 inches in diameter. can this tool help ? BEST ANSWER: A 3 inch log wouldn't work. That's smaller than the opening in the base. I need to drill 1/2" holes in the base of a stair rail so I can install wrought iron balusters. 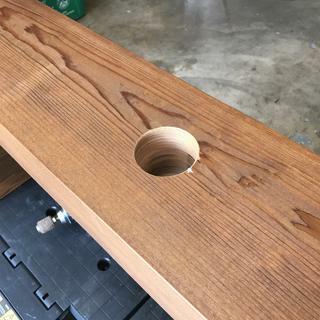 The top rail is fine and has 1/2" holes already, but on the base where the stairs angle up the builder had nailed in the wood balusters, so there are no holes in the base where I removed the wood balusters. Can this drill guide attach to the base were the bottom the the baluster needs to fit so I can drill a straight and not an angled hole? BEST ANSWER: This is not the most stable tool however it did get me thru my project. if the base is 100% supported and you work carefully you can make this work. It won’t attach without modifications. 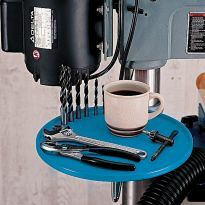 This item works best on broad flat surfaces like a work table top to drill dog holes or against a wall. is the adjustment of the guide angle infinite or limited to 5 degree adjustments? Can I use a mortise chisel bit ? BEST ANSWER: No, there is no attachment to hold the mortising chisel. 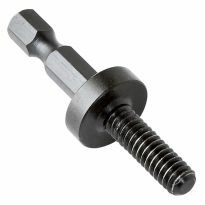 can a flat bottom bit be used? Yes. I actually used this to drill mortises with Forstner bits when I built my gate. will it accept a 1/2 chuck drill as well as the 3/8 chuck ? The project is pillar bedding a gunstock. I want to increase the size of an existing 1/4" hole to 1/2". The bit must follow the 1/4 inch hole exactly. The 1/4 inch hole is about 3 inches deep and at a slight angle in the stock. Can I do this with this drill guide? What is the largest diameter bit (forstner) that this will accommodate? Will a 1.5" or a 2" fit through the hole in the base? BEST ANSWER: I do not know if the bit will fit or not, but my advice to you is to not purchase the devise. Even if the bit will fit the torque required to drill the hole will overpower the devise. The unit is too weak to provide any accurate support. I purchased it to drill 3/4" holes in a carpenters bench and after using it once wished I had not. You will be miles ahead by just building a gig for the need and you will still have the money in your pocket. What is the widest board I can self center with this device?